From our Farm to your Home and Garden! When preparing your garden spot, you may find it helpful to map out your garden. Bulb size, period of bloom (early, mid or late season), and bulb height are important factors in planning. Bulbs do well in a variety of conditions ranging from full sun to mostly shady. Ideally bulbs should be planted as soon as you receive them in the fall. So be prepared - have your soil loosened to the proper depth, ready for planting! Soil Preparation: Provide the bulbs with well-drained, loose, porous soil. The addition of compost, sawdust, peat moss, and other humus-rich substances can improve heavy clay soils. Addition of the same materials helps excessively sandy soils to retain moisture. Be sure to work these materials to depths of 12 to 18 inches so that the new root systems have a chance to thrive. Have bulb fertilizer on hand for planting day to mix into the layer of soil on which you place the bulbs. Prepare the Bed. Dig out the soil to the proper planting depth. A shovel is quicker and easier than a trowel. Condition the Soil. Loosen the soil an additional 4 to 6 inches and add bulb fertilizer. If your soil is sandy, mix it with peat moss or leaf compost. For clay-based soil, add coarse sand or peat moss. This helps improve drainage. Plant tulips about 6 to 8 inches deep, measuring from the base of the bulb. If you add mulch after planting, include this as part of your overall planting depth. After the tulips have passed their peak, top the old blooms and let the plants die down normally. This will help the new bulblets grow bigger. Plant the Bulbs. Place the bulbs firmly in the soil, pointed end up. Plant bulbs in clusters of 10 or more to produce the best effect. Tulips, Daffodils, Iris and Hyacinth bulbs should be planted about 8 inches deep and about 4 to 6 inches apart, while Crocus, Muscari and other Specialty Bulbs like Snowdrops should be planted about 5 inches deep and about 3 inches apart. Cover with Soil and Mulch. Cover the bulbs with soil, water well, and then add a thin layer of mulch. Colder climates may require thicker mulch. Where to Plant. Easy-to-plant spring-flowering bulbs can be planted almost anywhere in well-drained soil, full sun to partial shade. Warm climates are more challenging and may require pre-cooling of the bulbs each fall prior to planting. Use in unlimited combinations as spectacular borders and groupings. We package our bulbs in what we consider to be the minimum grouping quantities so that you attain a dramatic effect. TULIP Bulb Care: In the spring, at the end of the season, be sure to top the blooms off of your tulips before they start to fall. We recommend that you dig your tulip bulbs each year, after the foliage has died down completely. They may be dug and stored away from direct heat and cold, with adequate ventilation, and re-planted with a good fertilizer in the fall, along with any new bulbs you plant. Use a container that is at least 24 inches across for best results. Containers need adequate drainage - several holes in the bottom and a layer of pea gravel is helpful. Use fresh soil - not soil that has been used and re-used for several seasons. Water bulbs when planted and keep moist throughout the winter. Cover with a layer of mulch (2 inches) in areas where freezing occurs. Bring inside if weather gets extremely cold, and continue to water while the container is inside. Note: Bulbs planted in containers can freeze much easier than bulbs planted in the ground. Tulips.Com sends a planting guide with your order describing special considerations that are pertinent for particular varieties. Please feel free to call or email us with your planting questions (866-488-5477 / info@tulips.com). Have questions about your bulbs or flowers? Copyright Tulips.com 2018, Retail Division of Washington Bulb Co.
Fresh cut flowers are only half of what we do at Tulips.com. We also have a great selection of tulip bulbs, daffodil bulbs, hyacinth bulbs, and other specialty flower bulbs for spring blooming. Customers can place bulb orders from February to December for the biggest and best flower bulbs available anywhere - including Holland. 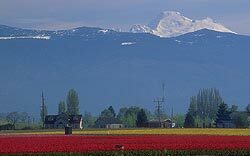 The mild maritime climate of the Skagit Valley allows our bulbs an extended growing season to mature and grow to larger sizes - growth that is supplemented by the rich topsoil of the valley. Need proof? Check out the blooms that the Tulips.com bulbs produce at our RoozenGaarde display garden. After our fields of flowers have been topped, the bulbs are allowed to mature and multiply, and are then harvested. Tulips.com then selects the largest bulbs from each year's crop so you can grow the same beautiful tulips and daffodils in your own home gardens.